A Brief History of the Diocese: Arunachal had the first encounter with Christianity with the coming of the French Missionaries Krick and Bourry who were martyred in Somme Village in Lohit District in 1854.The arrival of Salesian Missionaries in Assam latter in 1922 was a landmark in the history of the Church as Religious and educational institutions of the Church gradually welcomed the people of the region to a new life of faith and all-round development. Contact by students of Arunachal Pradesh in Colleges in Shillong in Meghalya and Assam gradually opened the way for faith in Arunachal Pradesh. Then Rector of Don Bosco Shillong, later Bishop of Dibrugarh and then became Archbishop of Guwahati, Archbishop Emeritus Thomas Menamparampil’s contact with Mr. Wanglat Lowangcha, a young tribal chief became a turning point in the history of the Church in Arunachal Pradesh. Bishop Robert Kerketta and Bishop Thomas established catechetical and educational institutions at Naharkatia and Tinsukia in Assam for the training of Catechists and youth leaders of East Arunachal. Fr. Job Kallarackal SDB pioneered missionary work in Tirap from the Parish at Naharkatia, Assam. He brought some Noctes and Wanchos to the Faith in spite of many kinds of difficulties. After him Fr. George Pallipparambil SDB, now Bishop of the Diocese of Miao took up the reins. His years of contact with the Arunachal Students and Officials in Shillong had made him known to many in Arunachal. His first appointment as the Rector of Bosco Bible School (BBS) at Tinsukia, brought him closer to the Arunachal Apostolate. BBS trained youth leaders and catechists of Arunachal, who later became zealous lay evangelizers. In fact they sowed the seeds of Catholic faith in Arunachal. With the establishment of the first Catholic Mission, School and Hostel as well as the construction of the first ‘pakka’ (Concrete) Church at Borduria in June 1992, Fr. George became the first resident Priest in Arunachal. Mr. George Nedumala and Miss Martha Mao joined him in July the same year. He worked with lay leaders and catechists for the spread of the Gospel in the Region. He invited trained Catechists, educators, youth animators and developmental agencies for improving the religious, social and economic conditions of the people along with other zealous missionaries. In the year 1992, the Missionaries of Charity opened their convent at Borduria to look after the poor and the needy. On August 2, 1993, Blessed Mother Teresa visited Borduria on the occasion of the Consecration of the Parish Church. This created history as that was the Saint’s first and only visit to Arunachal Pradesh, “in spite of many requests to various governments” in her own words. Health and social welfare activities gained momentum as the local leaders officially started and registered Seva Kendra in 1990. In the years that followed, many religious congregations came to Arunachal. Bishop Joseph Aind SDB DD whole heartedly supported the expansion of faith by establishing new centres for the people. In the year 1997, he appointed Father P K George as the coordinator of Church activities of East Arunachal. Father P K was based at the Literature Centre, Khonsa, Tirap District and travelled extensively strengthening people’s faith and contacting various leaders. He initiated the works at Kanubari, Rajanagar, Nampong, Roing, Deomali, Kheti, Lazu, Tezu, Neotan, Miao and Changlang. The number of mission stations is growing ever since Pope Benedict XVI erected the diocese of Miao on December 7, 2005 with Rev. 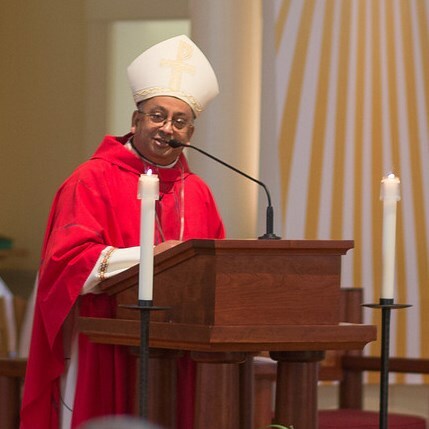 George Pallipparambil SDB, as its first Bishop. The Episcopal Ordination took place on 26th February 2006 at Miao. As of today, the Catholic population of East Arunachal Pradesh is about 87,000. The number of schools and hostels, training centres, primary health centres, and Churches are a testimony to the growth of the Church in Arunachal Pradesh.